Stegosaurus belongs to the genus of the stegosaurid dinosaur that roamed the earth in the Jurassic Age, in North America and Europe. The Stegosaurus was distinct in features for its spiked tail and plates. The name Stegosaurus means ‘roof lizard’. It lived some 155 million years ago, amidst the sauropods. The Stegosaurus was a large plant eating dinosaur. It had a very distinct and unusual posture. The Stegosaurus had an arched back and short fore limbs. Its head was held low and its stiff tail was poised high in the air. The Stegosaurus faunted an array of plates and spikes. The spikes were probably used as defense machanisms, while it is believed that the plates could have been the same, plus doubled up as a heat control feature. Stegosaurus was nearly the size of a bus and its unique anatomical features were never shared with the other stegosaurians. It was around 30 feet long and stood a good 14 ft tall! It was a quadrupedal, or four legged dinosaur and also one of the easiest to identify because of its double row of plates rising vertically and its arched back. The hind feet had three toes each and the fore feet had five toes each. The forelimbs were shorter than the hind limbs. The skull was low, probably to feed on low-growing vegetation. The Stegosaurus was considered to be the largest of the stegasaurid family and existed throughout the late Jurassic period. It’s name is derived from the Greek word ‘stegos’ meaning roof and ‘saurus’ meaning lizard, making it the ‘Roof Lizard’. The very first fossils and relics of the stegosaurus were excavated in the western parts of North America in the year 1877 by Othniel Charles Marsh. In fact it wasn’t until 2006 that more fossils were uncovered outside of North America blowing away the theory that they were exclusive to North America. The 2006 discovery in Portugal was the first of it’s kind in Europe, indicating that the dinosaur existed much further adrift than had once been thought. Despite there being various classifications for the different stegosaurus dinosaurs most of these were based on only a few minor differences in appearance. The foremost among them include the long spined roof lizard or the Stegosaurus Longispinus which measured about 20 ft long and owes its name to its four extraordinarily long tail spines. The armored roof lizard or stegosaurus armatus was not only one of the first stegosaurus remains to be found but measured about 30 ft in length and possessed much smaller plates compared to the rest of its family. The most popular variant of the stegosaurus was the stegosaurus stenops or the narrow faced roof lizard which was usually shorter than the stegosaurus armatus but had a unique skeletal structure and several huge and expansive body plates. There are also several other variant species of the stegosaurus which have been discovered from time to time although most of these are still under observation and research, hence not much information is available on them. Some of these include the Stegosaurus Seeleyanus, Stegosaurus Sulcatus, Stegosaurus Affinis and the Stegosaurus Ungulatus. The stegosaurus was a large bodied dinosaur with a heavy arching back and a tail that was extremely tough and always held high in an upward position. (that’s correct unlike the cartoons, it didn’t drag along the floor). The stegosaurus measured around 30 ft in length, it had padded hoofs with the forelimbs having five toes and the hind limbs having just three. The overall structure and body shape indicated that the stegosaurus wasn’t a fast moving dinosaur and was most likely a slow wanderer. The head of the stegosaurus was quite small and insignificant compared to the enormous size of its body. The positioning of the head as is evident from the fossilized remains of the skull also prove that they were herbivores consuming simple vegetation that grew on the forest floor. Like all herbivores the stegosaurus possessed an extremely efficient dental arrangement which aided in the chewing and grinding of its food. This meant the bone structure of the skull and the jaws accommodated the stegosaurus with cheeks to store food whilst chewing and a set of small triangular, flat teeth which aided in grinding plant matter. A very interesting fact that has been noted by scientists is that despite their magnanimous body size, their brains were extremely small. Whilst their body weight stood close to 5 tonnes, its brain weighed a puny 80 grams. Another interesting theory about the Stegosaurus brain is the concept of a ‘second brain’. Many scientists have said the huge passage near the hip region could easily have housed something like a brain. This theory has been much popularized by scientists who acknowledge that the second brain was essential in organizing and controlling the various functions on the back part of the body. The most important corporeal feature of the Stegosaurus has to be its plates and the tail spikes which make it stand out among the various dinosaur species. There has been a lot of research regarding the function of these plates and tail spikes and a common consensus has been reached regarding the fact that these spikes and plates were usually used by the stegosaurus for defense purposes. The stegosaurus comprised of 17 dermal plates shaped like kites having four sides and it should be noted that these were not generated from the bones but rather protruded from the external surface of the skin. These plates are believed to have belonged to a kind of osteoderms which refer to a kind of bony scales on the body and similar bone structures can be observed in most lizards and crocodiles of today. 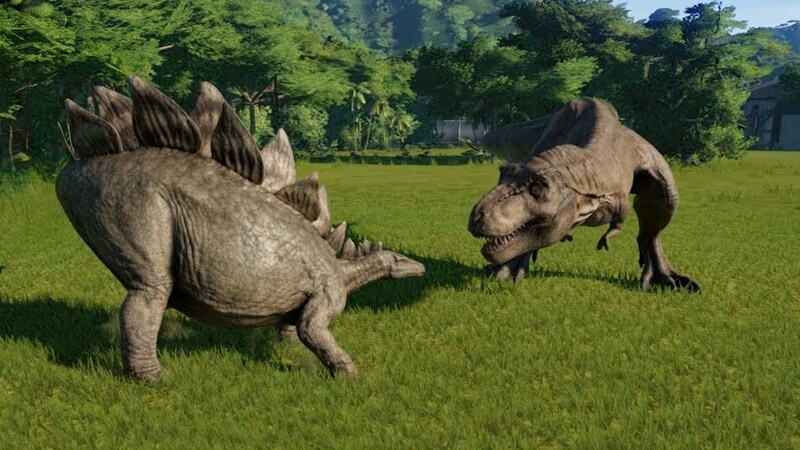 While these plates have been usually considered as being used for defense purposes against marauders who attacked these herbivores, it can be also be noted that they were not enough to guard the stegosaurus completely as the sides remained exposed to attack. However, the plates also have other functions like it helps to regulate body temperature of the stegosaurus though this fact is also debatable. The stegosaurus possessed about four tail spikes in addition to the 17 dermal plates and these tail spikes were also referred to as thagomizers. The use of the tail spikes have been highly debated from time to time. While a set of evidences do prove that these spikes were indeed used for defense and as a means for protection, it has also been noted that many of the body plates overlapped the vertebrae of the tail thus greatly constraining its movement.